Norwegian Christmas Fair/Norsk julemarked – Norwegian Society and Church Service in D.C. 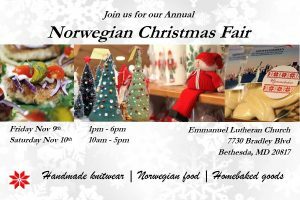 Please join the Norwegian Church in DC for their annual Christmas Fair on November 9 and 10! Get a Norwegian taste of Christmas with authentic Norwegian food, home baked goods, and loads of gift items for sale.